Growing up, my family went apple picking every fall, without fail. We went at the optimal time to pick Golden Delicious, our favorite variety. Despite the fact that there was an orchard in my hometown, we always drove about an hour north to a much larger orchard, where we picked bushels of apples before getting an afternoon snack of apple cider and doughnuts. We picked bushels of apples, which were loaded into the minivan and taken home, where one bag was washed and put in the fridge and the rest were stored in the garage. One by one, each bag was brought upstairs and eaten, until they were all gone. 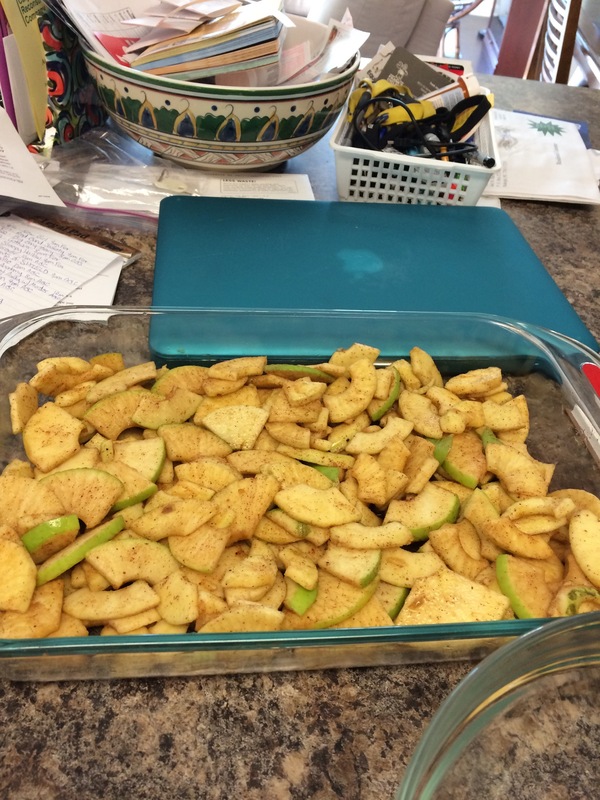 The apples were eaten individually of course, packed in lunches and eaten for after-school snacks. But the best thing to do with apples is to bake with them, and my mom always made the first apples of the season into apple crisp. A few weeks ago, my husband and I went up to the mountains to go apple-picking with friends. We had a wonderful time on a beautiful weekend, and brought home over 30 pounds of apples. I have to publicly thank Keith for carrying them all up the hill post-picking! 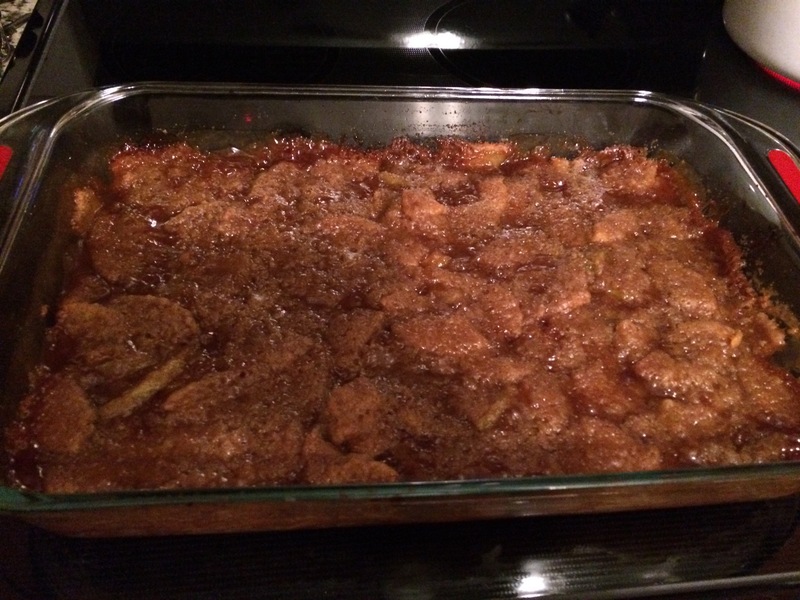 Anyway, it’s only appropriate that the first dessert baked with these apples was an apple crisp. How beautiful are these apples? The last time I went apple picking was when I was in college, and I had forgotten how much more delicious an orchard apple is than a grocery store apple. I bit into a Golden Delicious (which I never buy from the grocery store because they’re just not good), and I think I nearly swooned. In addition, I finally made something from Alex Guarnaschelli’s book that I bought over a year ago! If I’m honest with you all, I got the book because I just love the Iron Chef. Unfortunately, many of the recipes are too complicated and fancy for me, especially since I’m picky and not much of a cook. So her apple crisp was absolutely perfect because it wasn’t difficult and there’s absolutely nothing in it that I don’t like! I did tweak it a bit because I didn’t have all the ingredients – I substituted some local vanilla honey for the orange juice I was missing. It didn’t come out exactly as I thought I would – it all melted down into this lovely apple puddle seen above, rather than being nice crumbs. I think that’s because it was all brown sugar. But it was delicious, especially with some homemade whipped cream! What else should I make with my apples?